Well, it blew me away when I saw it today. The song’s lyrics are very uplifting, inspiring, an empowering anthem (with a great beat you can dance to) advising the listeners that we all have value, that we are all special, and no matter how badly we’re feeling about ourselves, for whatever reason, there is hope, it does get better, and we all have that explosive, beautiful spark inside us waiting to burst free. The video opens with Perry watching over a city (filmed in beautiful sections of Budapest). As she is singing, we see the characters, and they are instantly familiar. Two children, a brother and sister, cowering as their parents fight, the younger sibling covering her ears as her brother looks on helplessly. A gay teen, extremely shy, watching other kids dance happily and interact so easily — watching his dream guy from across a crowded dance floor, too crippled with shyness to approach him. A bald, eleven year old girl, a cancer patient, too afraid to leave her room and be around other people. Another girl, overweight, so self-conscious about it that she declines her friends’ invitation to join them in the swimming pool. Another teen, a street magician, terrorized by thugs. Each kid is suffering; each kid is in pain. Each one feels worthless. Each one feels there is no hope. Then, as Perry sings into the night, fireworks shoot from her heart. (Yeah, yeah, insert your joke about the sparks coming from her magnificent bosom here). But as the fireworks light up the sky and the joyous anthem continues, things start to happen.. The light bursts from the kids as well. Their inner spark is ignited, that light inside them finally free, and they become empowered — overcoming their fears and insecurities, surrounded by an aura of brilliant pyrotechnics. The overweight girl strips to her swimsuit and leaps into the pool as her friends smile happily; she emerges joyous, almost newly baptized, sparkling. She did it! The cancer patient witnesses a woman giving birth in the hospital as fireworks surround her — and sees the power of new life. She tentatively steps outside, the light bursting from her and giving her courage to join the increasing swell of teens dancing and running in the streets. The bullied teen fends off his attackers and impresses them with skillful magic tricks as he too emits dazzling light — his own inner light. The gay teen finds courage he never knew he had — he purposefully approaches his crush at the bar and kisses him tenderly as the room fills with fireworks. The young boy, protecting his sister from his parent’s argument, has had enough and sparkles as he rushes to his parents and physically separates them, stopping the fight. As the song builds to its climax, over 200 kids are running in the streets, dancing and joyously celebrating as they join in a courtyard in this beautiful city. Fireworks burst from them, their inner light exploding from their chests, unable to be contained any more. Now, to be fair… YES, it’s a fantasy music video and it would be so easy to dismiss all of this as pop fluff — Katy Perry sprinkling magic fairy dust and magically transforming people. And Katy Perry isn’t known for being a motivational speaker, obviously. No — That isn’t what’s happening here — it’s about perspective, seeing things in a better way, finding the beauty (the light) inside each of us, despite what we’re feeling, what shape we’re in, or what sickness we’re fighting. No one in the video changes physically, no one is magically cured of cancer. The video is about accepting yourself as you are, and that the light inside you is more powerful than you can imagine — that your greatness will not be contained. The obstacles can be overcome once the light shines upon them. The light inside can quite literally obliterate the darkness in our hearts and empower us, inspire us, and fill us with joy, no matter what our feelings, what our situation. That, my friends, is a hell of a powerful message, especially when you consider the audience toward whom it is directed: Teens. And it gets better, literally: Katy Perry dedicated the “Firework” video to the “It Gets Better” campaign, (click here for more info) which rallies against harassment in the LGBT community, an incredibly relevant action in light of the recent, tragic suicides by gay teens. Most every teen, at one or more times in his or her lives, feels at the edge of the abyss, so very different than everyone else, so powerless, so completely alone. Surrounded by darkness. We’ve ALL felt that way. …as the fireworks shoot from the heart of each teen into the sky, higher and higher, a crescendo of joy, of greatness, of self-acceptance, of empowerment. A light too bright to be contained. What a perfect message, not just to teens but all of us. In these troubled times, when so many feel so alone and different… What a welcome, empowering message. And what’s brilliant — the message is contained in a media directed at teens — a music video. It’s rare to find such an uplifting, positive and effective message directed at teens today. To find it in a music video, by Katy Perry is, to say the least, a very pleasant surprise that resonated with me. Kudos to Katy Perry and everyone involved for this one — because kids, it DOES get better. That light IS inside all of us. You’ll find it. To each person reading this, may you find that light inside yourself! 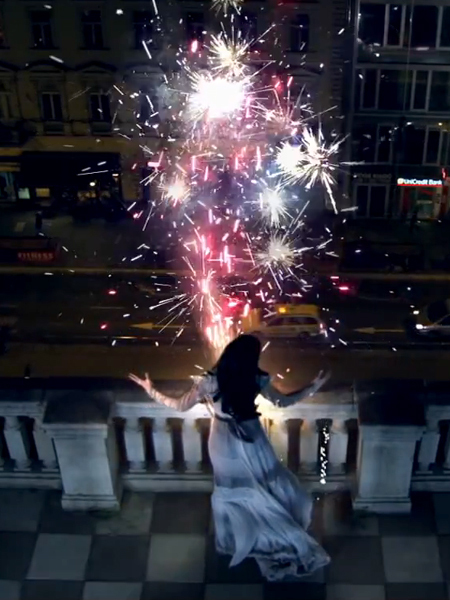 DISCLAIMER: “Firework” Songwriter(s): Katy Perry, Mikkel S. Eriksen, Tor Erik Hermansen, Sandy Wilhelm, Ester Dean. “Firework” music video images, and all Katy Perry Images / Katy Perry Video are Copyright © 2010 Capitol Records and Katy Perry and remain the property of the original copyright holders, and are used here for illustrative and/or entertainment purposes only, under what is believed to be fair use guidelines, and absolutely no copyright infringement is intended. Windows PC Security 101: How to protect your computer → ← Foxboro Founders Day 2011!